Public School Grants/Other projects - Rebecca Adams Green Foundation, Inc.
Well-educated kids are the most important factor in the future success of our country and our world. That's a big responsibility for our teachers - especially since they are operating on ever-shrinking budgets! Last year we awarded $2000 in grant money to the Loup City Public School teachers to go towards two projects - a classroom robot and playground equipment. We are excited to be able to offer again this year a total of $2000 in grant money to teachers! So many worthwhile programs have been cut in recent years so, for that reason, we’d love to see proposals for things such as field trips, art projects, instructional supplies, etc. and it would be a bonus if the proposal would include a group of classes. But please don’t limit your ideas to these! We would like to divide the funds into 3-4 grants but would also consider giving one grant for the total amount if we like the idea. All proposals must be received by March 5, 2017. Grants winners will be announced in mid to late March 2017. *Please be as specific as possible. *List all known costs relating to project/trip/supplies/etc. to the best of your ability. Please try to be as accurate as possible with all estimates. *Include a brief summary of how you would expect the acceptance of this proposal to affect your students. *Include a description of how, if your proposal is accepted, you will document the project for the RAGF. *Proposals must be received by 3/5/2017. *Proposals must be signed and dated by a Loup City Public School teacher. *Project/trip/etc. must be completed by the end of the 2017-2018 school year. If your proposal is selected we will require documentation of the use of the money within one month of completion of the project which would include, but not be limited to, a written description and photos and or videos of the activity. We are excited to announce the recipients of our 2017 Loup City Public School Teacher grants! Heidi Krolikowski was given $500 for material to develop four Circle of Friends groups - a program which facilitates social skills development in special needs populations, especially important with the increase in children found to be on the autism spectrum. And Jason Obermiller will receive $1000 to introduce drone technology to the students of his Wildlife, Life, Earth, and Physical Sciences classes. He will first obtain his professional drone license and then will use drone and video technology with his students to study environmental and wildlife changes in the community and to help with natural resources conservation. We are happy to be able to help these motivated educators with their projects to improve the education of our students! Kade Green (Rebecca's son) awards Heidi Krolikowski with a grant for helping students improve social skills. 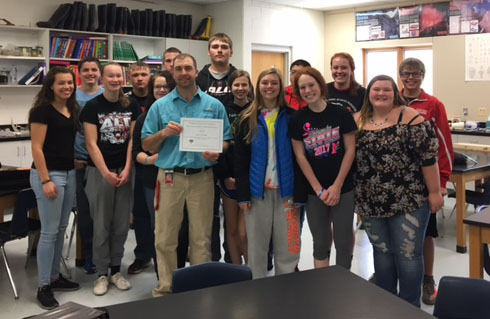 Jason Obermiller with his freshman students receives a RAGF grant for using drone technology in his science classes. 2016 Loup City Teacher Grant Recipients! Heidi Krolikowski accepted the $1500 award from the RAGF from Rachael and Kade Green to help with the purchase of new playground equipment. Teacher Teresa Walters was awarded $500 from the RAGF for a programmable classroom robot. Students learning how to use their new robot! Photo and article from the Sherman County Times with all the kids enjoying the new playground equipment! New playground equipment purchased with the help of the RAGF, the many fundraising events put on by the teachers, and other generous community organizations.